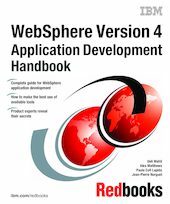 This IBM Redbooks publication provides detailed information on how to develop Web applications for IBM WebSphere Application Server Version 4 using a variety of application development tools. The target audience for this book includes team leaders and developers, who are setting up a new J2EE development project using WebSphere Application Server and related tools. It also includes developers with experience of earlier versions of the WebSphere products, who are looking to migrate to the Version 4 environment. This book is split into four parts, starting with an introduction, which is followed by parts presenting topics relating to the high-level development activities of analysis and design, code, and unit test. A common theme running through all parts of the book is the use of tooling and automation to improve productivity and streamline the development process. In Part 1 we introduce the WebSphere programming model, the application development tools, and the example application we use in our discussions. In Part 2 we cover the analysis and design process, from requirements modeling through object modeling and code generation to the usage of frameworks. In Part 3 we cover coding and building an application using the Java 2 Software Development Kit, WebSphere Studio Version 4, and VisualAge for Java Version 4. We touch on Software Configuration Management using Rational ClearCase and provide coding guidelines for WebSphere applications. We also cover coding using frameworks, such as Jakarta Struts and WebSphere Business Components. In Part 4 we cover application testing from simple unit testing through application assembly and deployment to debugging and tracing. We also investigate how unit testing can be automated using JUnit. In our examples we often refer to the PiggyBank application. This is a very simple J2EE application we created to help illustrate the use of the tools, concepts and principles we describe throughout the book.